IN A drought-impacted year when quality feeder cattle are both scarce and expensive, lotfeeders are looking to squeeze as much productivity from their purchases as possible through better respiratory disease protection and more structured backgrounding programs. 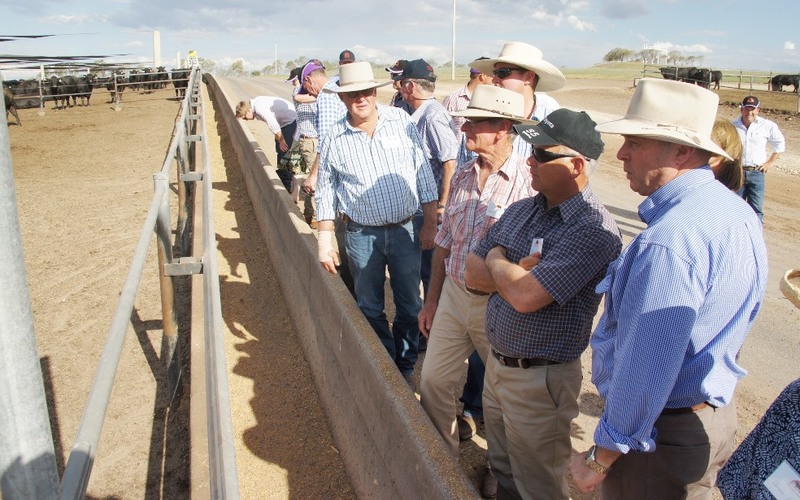 A good example being practised on a large scale is being seen at NH Foods’ Whyalla feedlot near Texas, on the NSW/Queensland border. 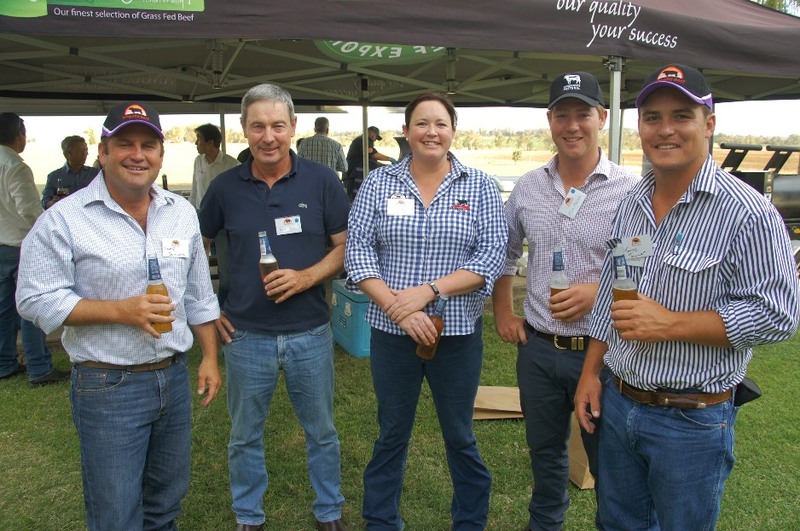 Whyalla hosted a producer day recently, attracting suppliers from across its feeder cattle catchment area of eastern Australia. Feedlot general manager Tony Fitzgerald stepped-through the business’s Bovine Respiratory Disease management program with Beef Central during the day. Mr Fitzgerald conceded that next year is likely to be another tough one for Angus feeder cattle procurement across the eastern states, given the impact of drought across NSW and southern Queensland over the past 12 months. That only heightened the need to extract as much performance as possible from incoming cattle, and BRD management was a significant part of that. 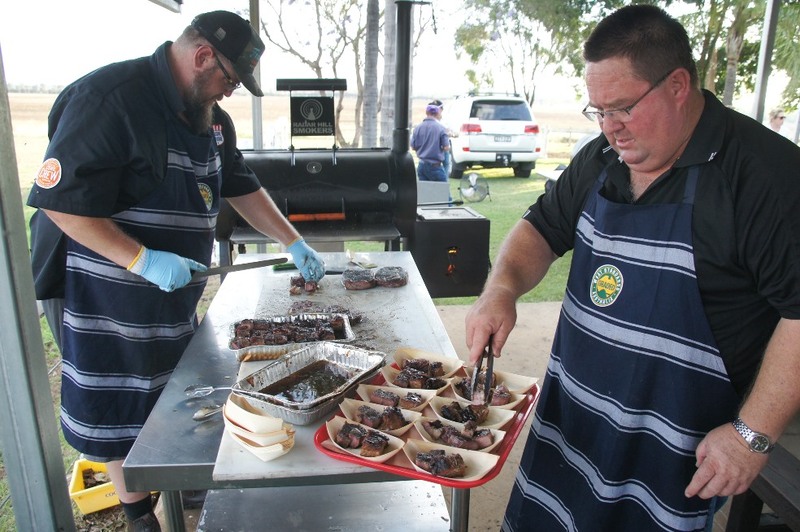 Depending on the mix of cattle required for different NH Foods commercial beef brand programs, Whyalla typically inducts anywhere from 1800 to 2200 Angus and Wagyu-type feeder cattle each week. While the yard feeds some Wagyu out to 400-days plus, the biggest proportion of cattle are Angus feeders directed into 150-day programs. “For us, BRD management strategies are just about everything. If you haven’t got healthy cattle, that performance is compromised – it’s as simple as that. Virtually every aspect of our feedlot management is geared around minimising the effect of BRD,” Mr Fitzgerald said. In Whyalla’s case that starts with paddock-procured cattle, adequately protected through pre-vaccination, and then managed to minimise stress through the backgrounding, induction and early feeding phases. Through a plan developed over the past three years, more than 90 percent of Whyalla’s bought feeder cattle are now backgrounded in paddocks near the feedlot for around a month, before entering the feeding pens. In 2016 Whyalla took a long-term lease on the nearby 6500ha Texas Station, now used for backgrounding purposes. 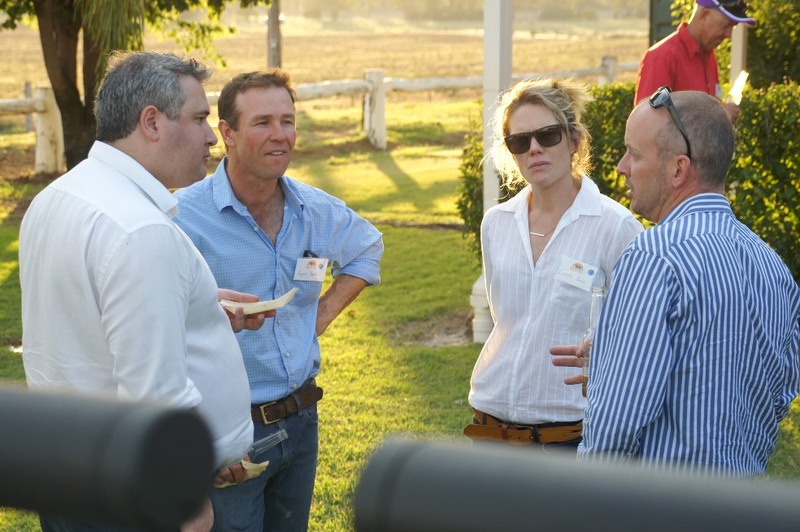 Long-term contract backgrounding partnerships have also been established with other land owners in several different locations across southern Queensland and northern NSW. At any given time, Whyalla can have 5000-6000 backgrounder cattle on its books. Backgrounding is grass-based, but young cattle also receive a corn silage based ration with some grain and cotton seed to lift energy and protein. The target is to achieve gains around 1kg/day in the paddock, but due partly to compensatory gain caused by drought nutritional stress, a lot of backgrounders have averaged closer to 1.3kg/day this year. While young cattle do gain weight during their backgrounding period, the purpose is not so much about achieving weightgain as it is about settling in, and establishing social groups to minimise stressors before entering the feeding pens. Animal stress has long been associated with BRD performance in feedyards. Young cattle are vaccinated and managed in well-socialised cohort groups to ensure a constant supply of well-set-up feeder cattle for introduction to the feedlot. “These vaccination and pre-conditioning programs help take a lot of the BRD risk out of the play,” Mr Fitzgerald said. Because of the heavy emphasis on Angus cattle as part of NH Foods’ brand programs, exposure to BRD risk was arguably higher at Whyalla than in many other southern Darling Downs feedyards, where a broader range of breed types are fed. The emphasis on Angus also raises Whyalla’s exposure to smaller beef breeding herds (more common in NSW), which further elevates BRD risk through co-mingling of smaller lines of cattle. Slick coated, and like peas in a pod…. 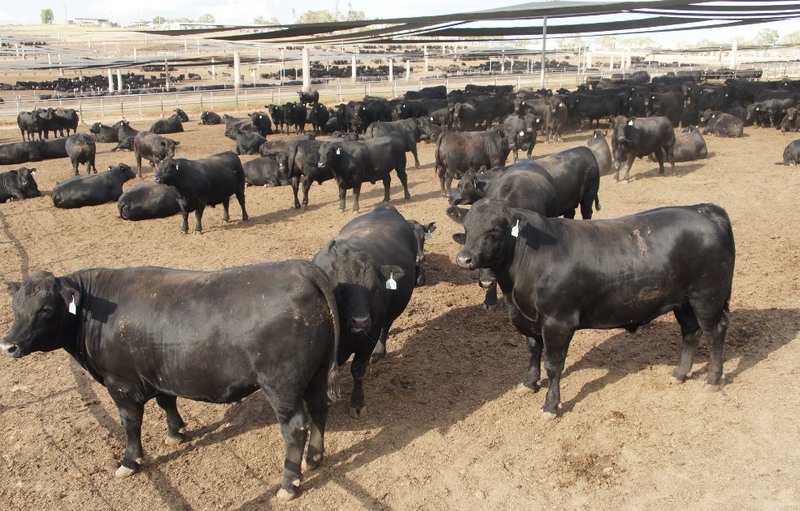 these 150-day grainfed Angus steers about to close-out at Whyalla feedlot near Texas showed remarkable consistency and zero sign of respiratory challenge. Click on image for a larger view. The yard’s management and vaccination program has had a significant impact on mortality and morbidity rates across the yard – probably halving numbers, in both cases. “Our feeding performance at the moment is probably better than it has ever been,” Mr Fitzgerald said. “We’re currently recording gains above 2kg/day for our 150-day program cattle, which is a pretty outstanding result on cattle fed that long. Even on cattle that we’ve had to push out to 160 or 170 days to align with production slots, we’ve still recorded outstanding feeding results, and having good control over BRD is a big part of that,” he said. Lower use of therapeutic antibiotics to treat animals under BRD stress was another strong incentive. “Prevention is better than cure,” Mr Fitzgerald said. Among Wagyu and Wagyu cross cattle fed at Whyalla, making up about 20pc of cattle on feed, the business is not quite so stringent on the backgrounding protocol, because Wagyu had proven to be a little less susceptible to BRD than British breeds. However all Wagyu feeders still receive a BRD vaccination before feedlot entry. Like many larger commercial yards these days, Whyalla offers a pre-vaccination price incentive of $8 a head for single shot, to suppliers for feeder cattle. Mr Fitzgerald said one of the unfortunate downsides when feeder cattle turnoff was influenced by dry conditions – as it had been this year – was that producers sometimes did not have the time or manpower to pre-vaccinate before delivery, according to protocols. That meant the percentage of bought backgrounders that had received some pre-vaccination on-farm was lower than normal this year – perhaps around 50pc. Over the longer term, however, a growing proportion of Whyalla’s backgrounders/feeders are now being bought with some BRD pre-vaccination, compared with four or five years ago. “At different times in the past, due to seasonal pressures, we have shortened the accepted window between BRD vaccination and delivery (ten days) to help-out suppliers in trouble – but we saw a definite reduction in the resistance those cattle showed to BRD, as a result,” he said. Whyalla is one of the largest and most technically advanced feedlot operations in the southern hemisphere. Currently operating at full capacity of 55,000 head, the yard holds a license (not fully constructed) for 75,000 head. The business will this year turn off more than 130,000 head, processed at company subsidiaries Oakey Beef Exports on the Darling Downs or Wingham Beef Exports in the Manning Valley in NSW. The feedlot directly employs 90 staff and contractors across livestock, feedmill, animal health, welfare and maintenance roles. Coming up: Beef Central profiles 30 years of NH Foods feedlot operations at Whyalla, and what lies ahead. Excellent article and a great example of proactive cattle and client (supply chain) management – Will done Fitz … great to see you doing well in the new job ..